Add some caramel. Add some honeycrisp syrup. (Have I overused my honeycrisp syrup yet this year? Please say no.) Add a slight spritz of lemon. 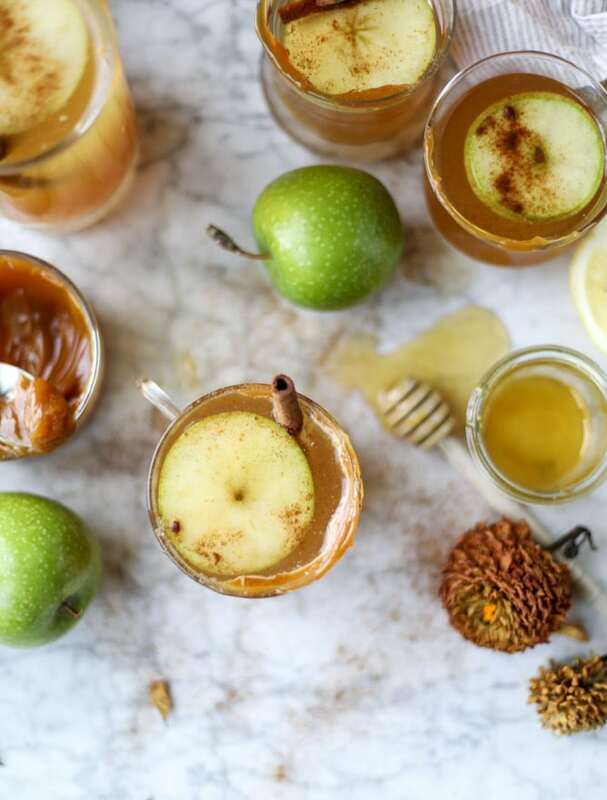 Make a hot and steamy caramel apple hot toddy! Then try to tell me it’s not your thing. It will totally be your thing! I promise. It’s like the drink version of one of those green apple, caramel-covered lollipops that you occasionally would get while trick or treating. One of those sounds so amazing to me at the moment aside from the fact that when I chipped my tooth ON A CROISSANT a few weeks ago, I figured that I shouldn’t eat something like a freaking caramel. And no, I’m really never getting over the fact that my tooth chipped on a croissant. EVER. If a croissant isn’t the most pillow-like food there is, I don’t know what is. Truth be told, I don’t really looooove hot beverages. I’ve talked about this for ages, with it being most likely the reason that I didn’t love coffee back in the day and couldn’t really even bring myself to want get into it. In fact, I don’t love beverages at extreme temperature, be it hot OR cold. I’m the weird person who drinks water without ice and what not. You know. Everyone has always talked about how warm beverages are comforting and relaxing but I never really felt that way. Until I got into coffee that is. Now, I will always prefer it iced, but the occasional hot coffee is okay. I really love hot coffee in the form of eggnog lattes and can’t WAIT for that season. One thing that you all know I can’t get behind is tea. To me, tea tastes like dirty water. I mean, maybe if I add a ton of milk and sugar and spice or something I’d be into it. But regular tea? Meh. Whatever. So I was pleasantly surprised a few years ago when I was really into a hot toddy. Though I guess I shouldn’t be since it contains bourbon? This is one of theeeee best flavor combinations ever. Your favorite bourbon, a small spoonful of caramel that melts into the warm liquid, the honeycrisp syrup… ooooohhh. It’s divine. Puhlease let this recipe grace your weekend. Fill a cup or mug with the bourbon, caramel sauce, syrup and lemon juice. Pour in the hot water and stir until the caramel and honeycrisp syrup dissolves. Clearly this is the answer to everything. Even though it is 9 in the morning, I desperately want to make this right now! This looks incredible, thank you for sharing! Oh wow this looks so delicious! I can’t wait to try it! so glad you made the syrup!! i love it! These photos!!! Got me so excited for more fall and winter recipes because the photography is just toooo good! These are totally going on my holiday dinner party menu! This looks absolutely amazing, but can we talk about the Copper Kettle tho?! So Vintage! Ok so firstly that kettle is freaking gorgeous 😍 and secondly I absolutely need this drink! Hot toddy’s have never been a thing for me, kinda like mulled wine I just don’t care for them you know? But this? With the caramel OMG yes! thank you so much! i have always been the same way, haha. Yum! I just said to my husband the other day…I want to make some hot toddy’s, well here is our recipe to make them! Chipped a tooth on a croissant, yikes! That’s not fun, sorry to hear about that. I feel like I would have been so dramatic that would have ruined my meal, lol..depending on which tooth. My dad actually chipped his front tooth in half the morning of my wedding…thankfully his dentist went in immediately to fix it. I guess better him that day than me, haha! Love that copper kettle, nice touch! You’re always so great with details! oh my gosh! now that is nightmare status! Do you use the juice of one lemon per drink? i do not! i just use a little spritz from a wedge. but you can totally use as much lemon as you’d like! If it makes you feel any better, I have a second degree burn on my hand right now because I spilled oatmeal on it! This looks amazing. Not a big bourbon fan, thinking about a flavored vodka or spiced rum instead.